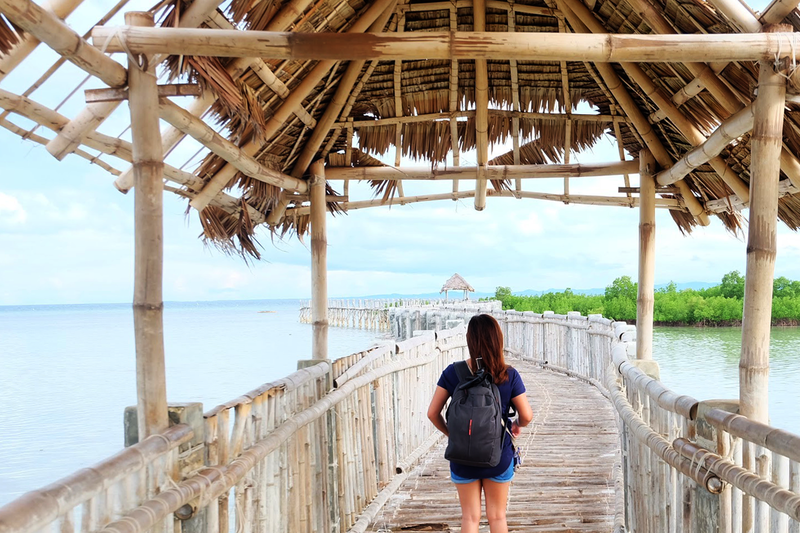 If you read my previous post, you would know that during Melanie and I's weekend Olango Island trip, we went around with bikes and our first destination was the Tungasan Boardwalk. 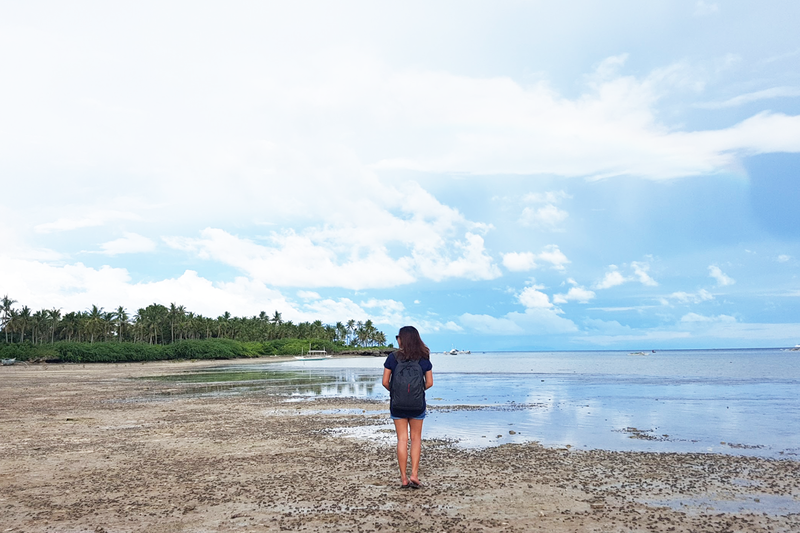 We mistook this place as the Marine Sanctuary that we were supposed to visit. This is where I learned that sometimes, misadventures lead us to fortunate escapades. 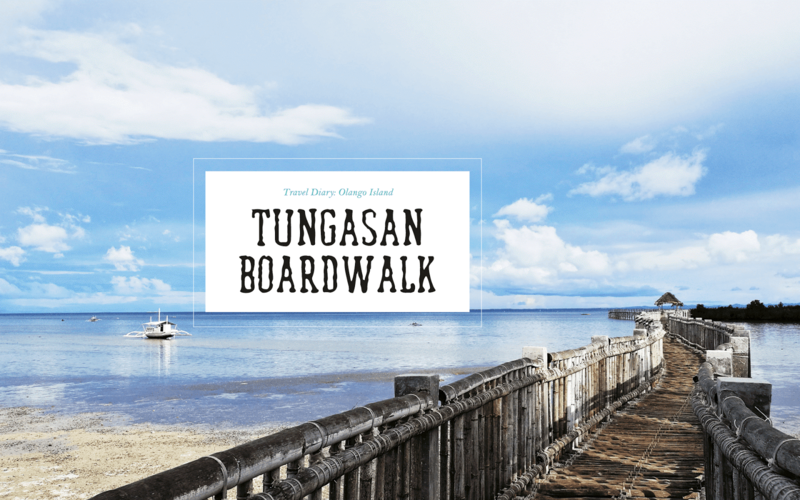 We may have made a wrong turn but it was practically a good wrong turn because we discovered a beauty in Tungasan Boardwalk. 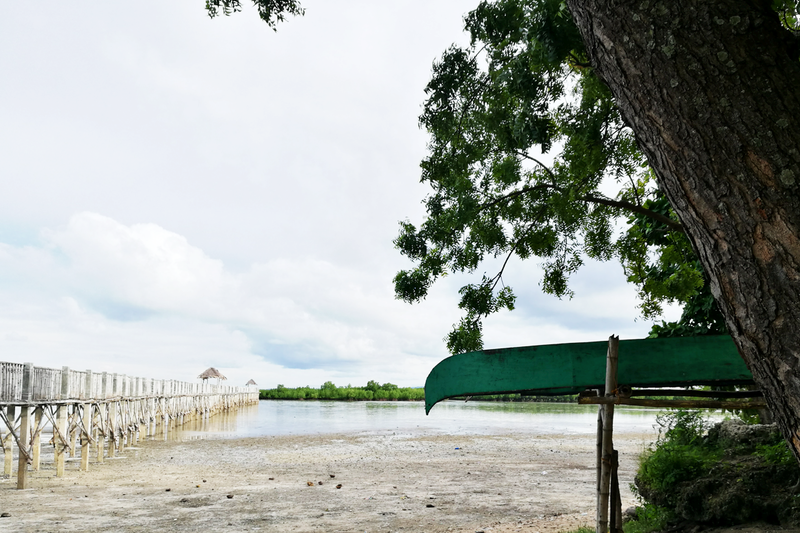 Mel and I were greeted with a stunning view of a wide shoreline, a breath of fresh air, and wide smiles of the kids playing around the boardwalk. While we were busy going around the place and capturing photos, we were astounded when we saw the breathtaking colorful arc in the deep blue sky. 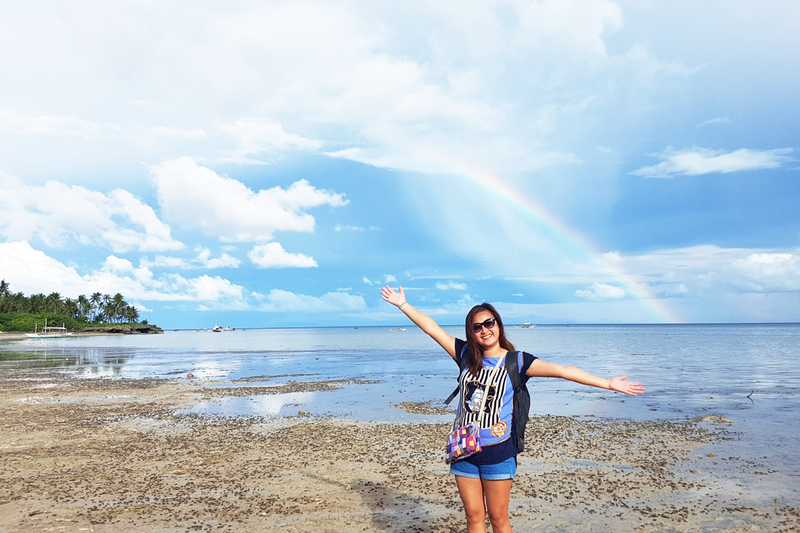 We took advantage of it and didn't miss the chance of taking photos with the rainbow in our background. 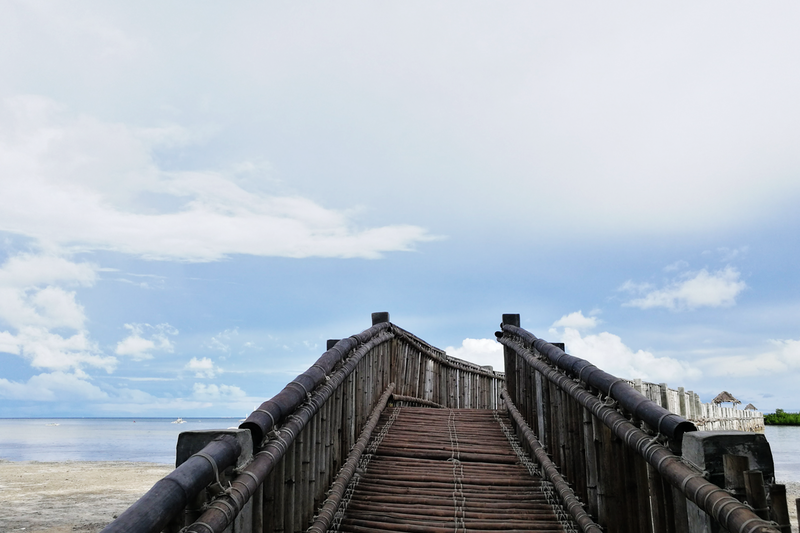 I crept my way on the boardwalk because I was kind of, no scratch that, I was downright scared because I saw that there were some parts in the boardwalk that were broken. 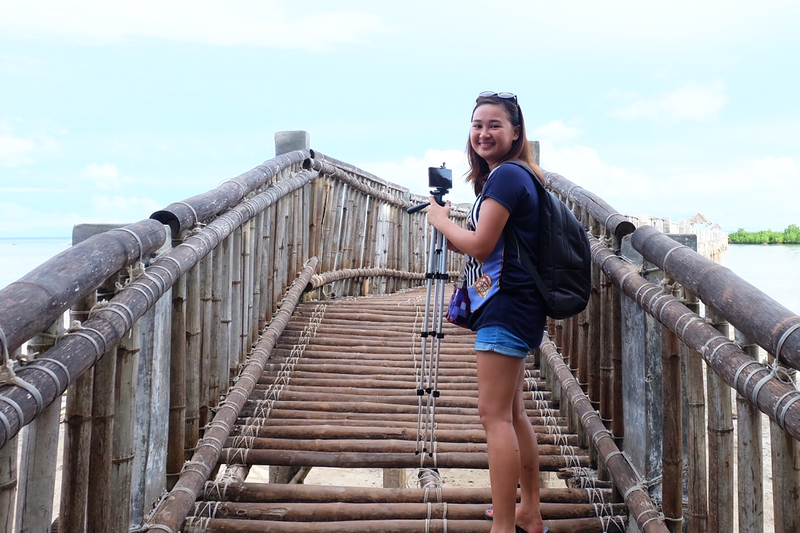 How I wish we were able to reach the endmost part of the boardwalk but we didn't. First, we were too scared walking on the boardwalk and second, the boardwalk was so long! It was like an endless spine of logs that you wouldn't know what lies at the end of it! Well, okay I'm overreacting. Haha. 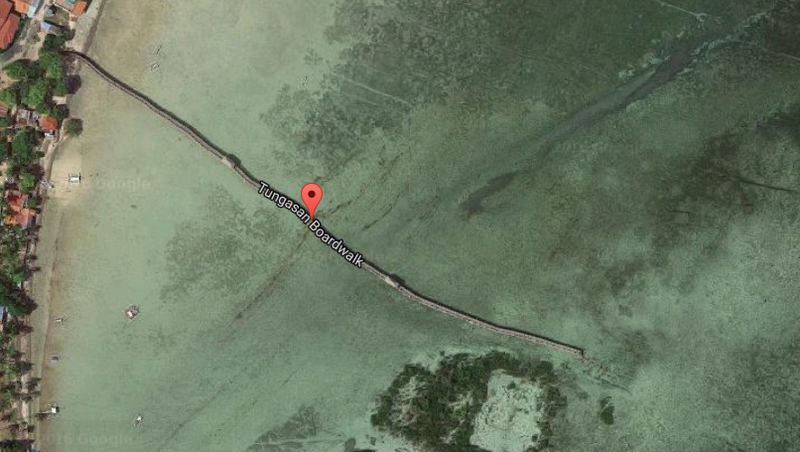 Anyway, I attached a photo that I got from Google Maps below so you'll see what I'm talking about! 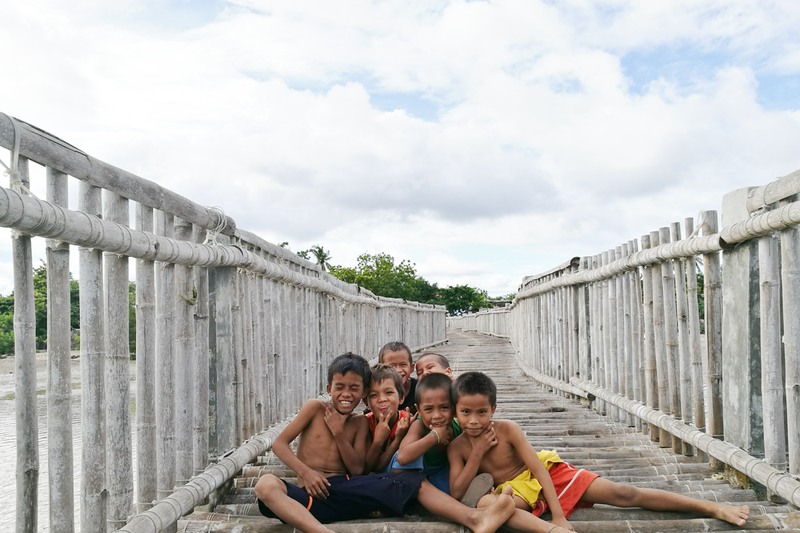 These kids followed us everywhere we went while at Tungasan Boardwalk. I don't want to be a hypocrite here but I was in all honesty irritated how these kids were so persistent and stubborn. Mel and I kept asking them nicely to back off even just for photo-taking purposes but they kept photobombing and stomping on the boardwalk that we really got frightened. 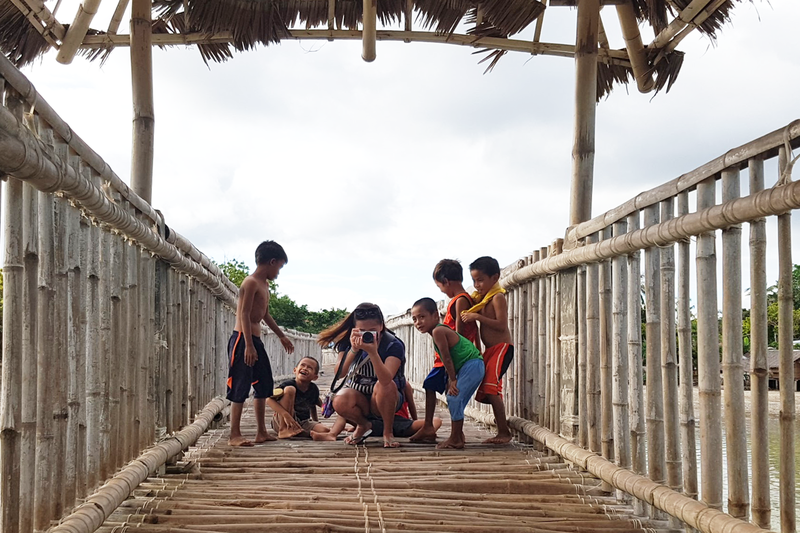 What also made me both infuriated and disheartened was these kids kept saying offensive words, sang various songs with obscene lyrics, and how they repeatedly spoke and yelled the words, "Give me money!" I realized maybe they were smiling when they saw us arriving because they thought they could grab the chance of taking out some cash from us. I'm not judging but this is actually not the first time it happened to me. 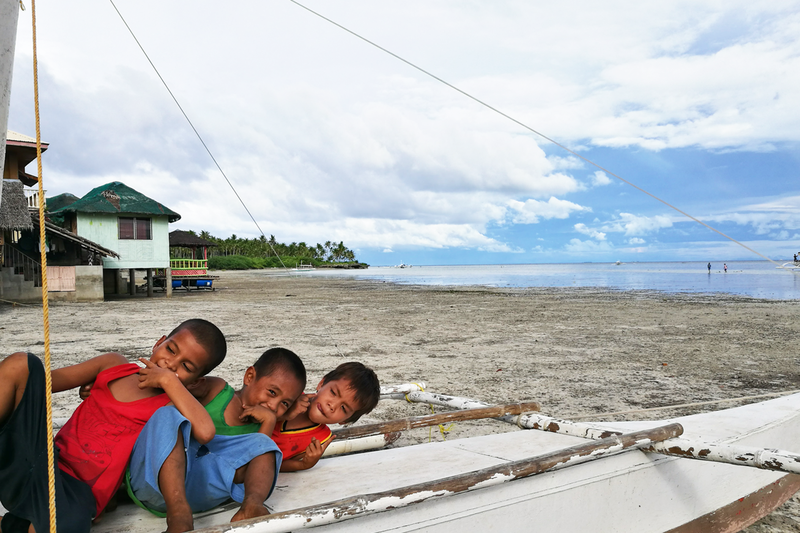 When Sheen and I went to Olango Island last year, we also met a few kids greeting us with "Annyeonghaseyo" while keeping their palms open (a demonstration of them asking for money). They also kept shouting, "Taga-i ko'g piso!" (Give me a peso!). When we replied, "Wala mi kwarta." (We don't have money. ), they yelled, "Ay! 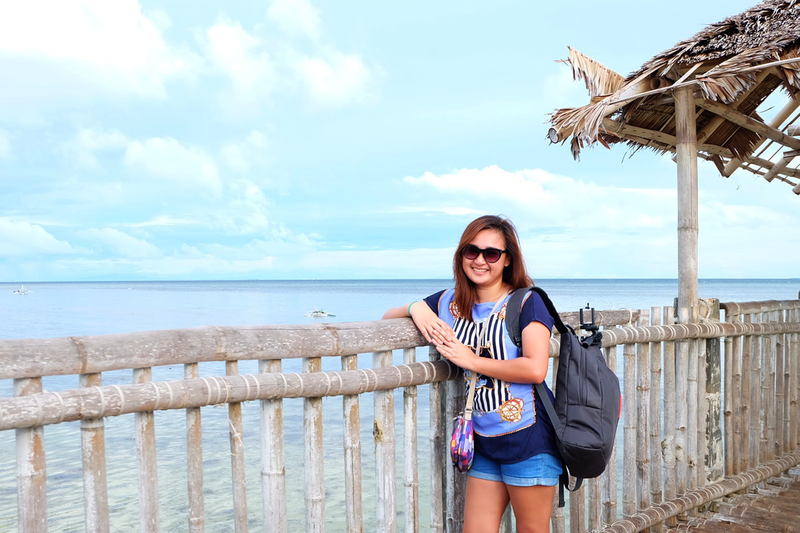 Dili diay foreigner!" (Oops! You're not foreigners!). It's just so sad how these kids were maybe taught by their elders how to ask the tourists for money. 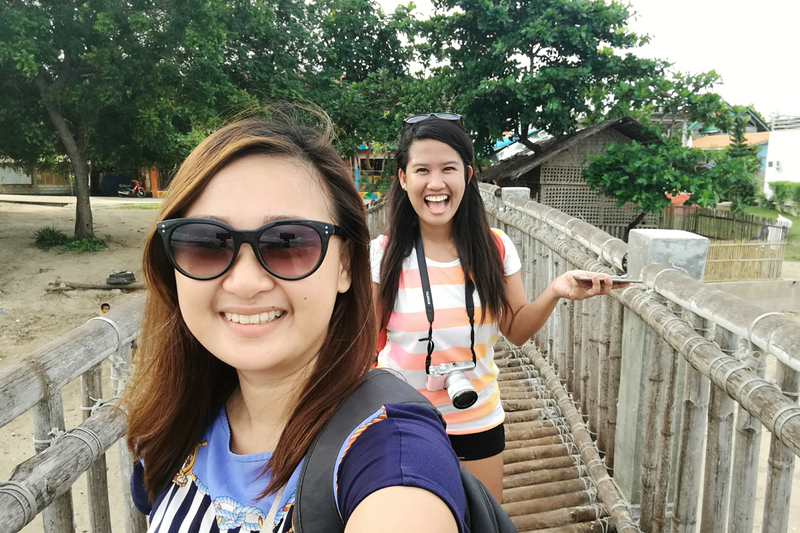 But despite the quite unfortunate incident, we still enjoyed our quick visit slash photoshoot session at Tungasan Boardwalk. 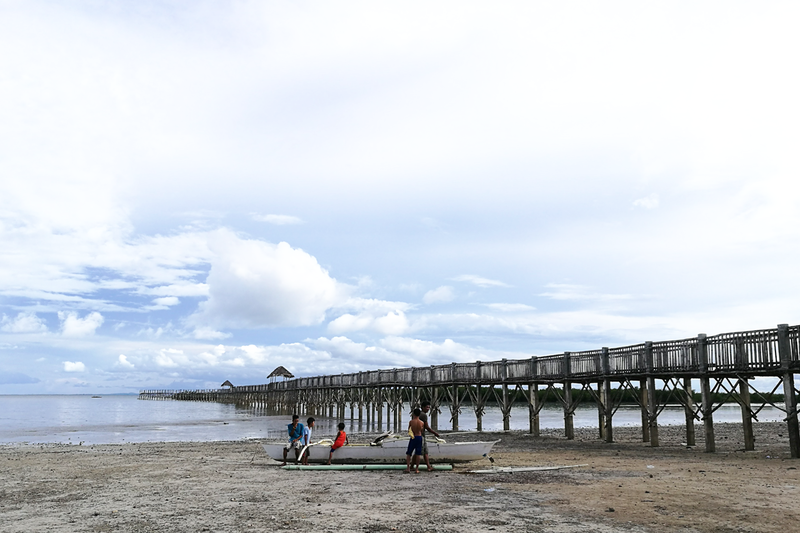 The place is a real beauty and I wish the local government would spend a little more effort to keep the boardwalk safe not just for the tourists but for the locals as well. I'm not sure but maybe the Fish Sanctuary that they were claiming must be located when you reach the end of the boardwalk. Mel and I stopped at the first cottage in the boardwalk and went back to head out to our next destination.